One of the greatest pianists of 20th Century, tremendously influential and prolifically recorded, yet a ultimately a fairly minor peripheral character in rock ‘n’ roll. Johnson was born in 1904 Kansas City, a city which boasted an unrivaled musical vibrancy during the prohibition years of the 1920’s and 1930’s when its reputation as a wide open town that flaunted societal constraints provided the young pianist with an abundance of opportunities to make a name for himself. The countless clubs that lined the streets used live music as an added elixir for those violating the Volstead Act and Johnson was unmatched in his ability to create a good time spirit that matched the potent booze being served. When an underage Joe Turner, who was already big enough to pass as an adult, got a job hauling booze from the basement in a club and then moved into bartending, he began singing along to Johnson’s work on the keyboards and the two formed a magical partnership that lasted decades. Turner’s ability to endlessly ad-lib lyrics meshed perfectly with Johnson’s indefatigable energy on the ivories and their gigs proved so popular that it attracted the attention of legendary talent scout John Hammond who recruited the unknown duo to perform at the From Spirituals To Swing concert in late 1938 held in New York’s prestigious Carnegie Hall. The two promptly stole the show, igniting the national boogie woogie craze which enabled them to have their pick of playing the hottest nightclubs in New York. Johnson’s reputation was further bolstered by pairing up with two other giants of boogie piano, Albert Ammons and Meade Lux Lewis, the three of them sharing stages where they’d duel one another in exhausting exhibitions of skill, stamina and dexterity. But this ideal platform for his abilities would come to an end when World War Two put a damper on the joyous sounds he specialized in. Though he’d recorded a lot over these years the changing mood and musical tastes of the country ensured that his time in the spotlight was coming to an end, as his lack of vocals meant he’d be enlisted to back others on record or on stage rather than be the featured performer as he’d been when boogie woogie ruled the day. 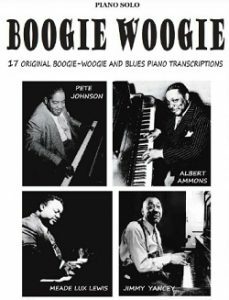 Yet in many ways this suited the modest Johnson and he proved to be an effective accompanist, often playing behind his old pal Joe Turner who likewise was still never at a loss to record but was struggling to find a fit in music that suited him as much as boogie woogie had. When that style finally came along in rock ‘n’ roll in 1947 both Turner and Johnson were nearing middle age and though it suited them in every way record labels were still not convinced it was the right direction for either of them and so, together and separately, they only dabbled in it for the rest of the decade. Johnson got his chance to cut some sides as a featured artist again in 1949 and 1950 and while his skills hadn’t diminished at all, the piano instrumental as a whole hadn’t quite caught on in rock and they failed to find a wide audience at the time, though years later one of his final records became a oft-referenced highlight of that era of rock. 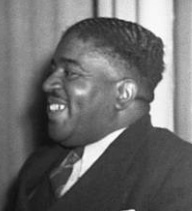 Johnson wouldn’t stick around long enough to try and pursue it any further however, as tiring of the grind he moved to Buffalo, New York and into semi-retirement from music, where he worked a series of ignominious laboring jobs and merely supplemented his meager income by playing clubs around town, a far cry from his headlining days in The Big Apple. On occasion he’d come out of hibernation and join Turner for gigs or in the studio, but a series of health problems, including multiple strokes, severely hampered his ability to play piano. Almost destitute in the mid-1960’s he was the recipient of a lot outreach efforts by musicians and writers and in 1967 he made his final appearance at the Newport Jazz Festival. Initially he was merely to be announced to the audience – the greatest boogie woogie pianist of all-time – while his lifelong friend Joe Turner held him by the arm as he took in the applause. Turner then dedicated their co-written theme song, “Roll ‘Em Pete” to its namesake upon which Johnson shocked everyone in attendance by making it over to the piano where despite not having been able to play for years, managed to play the right hand parts as Turner wailed alongside him. Two months later, in March, 1967, Johnson died at the age of 62. As sideman… behind Big Joe Turner.